Gevulde Buffalo Blue Cheese Pretzels. 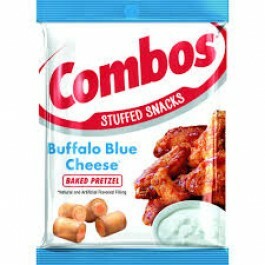 Volgestopt met Combos heerlijkheid. Krokante pretzels met een buffalo blue cheese vulling. Wheat Flour, Vegetable Oil (Palm Kernel Oil, Palm Oil and/or Hydrogenated Palm Oil), Whey, Maltodextrin, Food Starch-Modified, Salt, less than 1.5% - Buttermilk, Corn Flour, Dextrose, Tomato, Baking Soda, Sodium Diacetate, Sodium Acid Pyrophosphate, Garlic, Cayenne Red Peppers, Soy Lecithin, Yeast Extract, Onion, Spice, Modified Corn Starch, Sugar, Artificial and Natural Flavors, Vinegar, Paprika Extract, Acetic Acid.